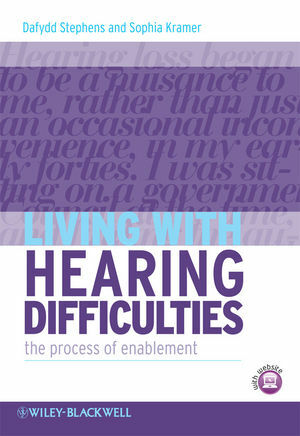 Living with Hearing Difficulties is a source-book for professionals who encounter and support individuals with hearing difficulties. It will also be of interest to people with hearing difficulties themselves and those close to them. The book highlights the concept of audiological enablement as being an interactive process requiring the active involvement of both clinician and patient. Section 1 addresses types of hearing disorders, the impairments they cause and also the process of help seeking. Section 2 deals with the effects of hearing impairment on communication and psychosocial functioning. Section 3 considers the individual in their environment; their family, work, and leisure. Section 4 elaborates on the process of enablement in a non-prescriptive manner. The authors approach the problems and needs from the standpoint of what the patient/client is seeking. Enablement is seen as a team effort between the professionals, the patient and their family in an ever-changing environment. This entails using any relevant techniques to ensure the well-being of the individual with hearing impairment; that end remains very much their goal. The book also has a companion website www.wiley.com/go/stephens which hosts additional downloadable documents as well as a demonstration of the concept of the signal-to-noise ratio. Dafydd Stephens FRCP, is Honorary Professor of Audiological Medicine at Cardiff University, Wales, UK. Sophia E. Kramer, PhD, is Senior Researcher and Psychologist at the Department of E.N.T. / Audiology / EMGO Institute for Health and Care Research at the VU University Medical Centre in Amsterdam, the Netherlands. The need for this book. The World Health Organization classifications. Theoretical/management models in the general rehabilitation literature. The role of Positive Experiences associated with hearing impairment. Relevant measures in assessing patients’ needs and the outcomes of interventions. Development of a preliminary model appropriate to hearing impairment. Becoming aware of hearing difficulties. The decision to seek help. 3. Types of Hearing impairment and their consequences. Basic anatomy and physiology and their implications. Purposes and process of assessment. Type of hearing impairment and their consequences . 4. The influence of other factors on assessment and goals of enablement. 6. Social and emotional aspects of hearing impairment. 7. Hearing impairment in the family. Impact of hearing impairment on significant others. Inclusion of significant others in enablement programmes. Hearing impairment arising from genetic causes or with a familial basis. Impact of having a family history of hearing impairment. 8. The process of enablement at work. Impact of hearing impairment on occupational performance. Impact of work related hearing impairment on significant others. 9. Leisure and the wider social environment. Opportunities for entertainment and leisure . Human rights, political life and citizenship. 10. The process of enablement 1: Evaluation and decision making. 11. The process of enablement 2: Short-term remediation. 12. Enablement 3: Ongoing remediation and Outcome assessment. Appendix - Longitudinal changes in enablement needs of older people with hearing impairment by Louise Hickson.